My magical career began in high school when I was cast as The Incomparable Rosalie in the musical “Carnival!” The part had a lot more “meat” to it than that of Lily, the ingenue. In 1979 I met and married Bobby Cordell, formerly of THE BOBBY CORDELL MAGIC SHOW. We became working partners. Our magical performances took us across Texas, into Mexico and to The Magic Castle in Hollywood. Our week at the Castle put me on stage as an assistant and, as the only speaking cast member in that particular line-up, the emcee. At that time, I was the only woman, other than Diana Zimmerman, to have acted in that capacity. Life with Bobby was never dull. He set the world's record for 36 Hours of Continuous Card Magic - beating Harry Anderson's 24 Hour Record. Of course, you realize he had to practice all those tricks on someone - care to guess why I'm not crazy about card tricks? The Bobby Cordell Magic Show consisted of Bobby, myself, my daughter Trisha, and a variety of doves, rabbits and DUCKS. The first duck was used in the dove pan until it got larger. Then it was transferred to the doves to rabbit. What an appearance that was! The duck would spread his wings as the sides of the box fell - how could that creature with a more than three foot wing span come from that little box?! But, our duck lived in the backyard and swam in a wading pool. Not the neatest of creatures, we had to wash him before each performance. One show in particular was out of town and involved an early morning road trip. To keep the duck clean, it spent the night in my bathtub!!! I finally convinced Bobby to get rid of the duck when, due to its size, it began appearing when IT wanted to, not on cue. He promised to sell it at the local feed store. That night, when I arrived home from the day job, I asked Bobby if he had taken the duck in. Sure enough! But he had a suprise for me. We went out to the backyard and there was, not only the original duck, but another little one! Yes, they are cute - but such a mess to deal with! A few years later, I was rooming with a female magician who decided to smuggle two ducks into our apartment and "slip" them into the show without my knowledge. Once again, ducks in the bathtub. Do you see a pattern? 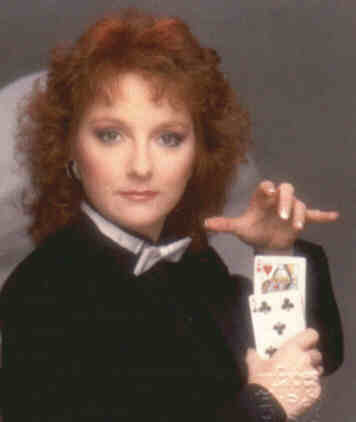 In 1989, after I made the magician disappear, I took a chance and tried my luck in Las Vegas. I worked as an environmental entertainer at Circus Circus. I love the phrase "environmental entertainer" - I expect to see someone dressed as a tree! I was fortunate to work with Tony Blanco, former Lucky The Clown of Circus Circus Reno and Las Vegas. After a three year hiatus, I took the stage, once again, as part of Laughlin's Gold River Carousel of Characters, with magic and balloon sculpture as my specialty. This page has appeared times.